The SaveEnergy flue gas condenser is a highly efficient system that recovers the sensitive, latent heat from polluted flue gas. The heat from the flue gas is extracted via the injected process water. In doing so, the sum of all water droplet surfaces creates a heat exchanger. This results in heat exchange surfaces that are the size of several football pitches. The water droplets continuously reform. The SaveEnergy heat exchanger (water droplets) can neither become soiled nor corroded. This results in low-maintenance, robust operation and sets top standards regarding availability and durability. In the SaveEnergy flue gas condenser, the sensitive, latent heat from the flue gas is recovered. In doing so, the heat from the flue gas is extracted via the injected process water. The surfaces of the many small water droplets assume the function of a mechanical heat exchanger. The heat from the flue gases is absorbed by the liquid and emitted via a plate heat exchanger to the heat consumer (e.g. fed into the heating network). The large heat exchanger surface (the sum of all droplet surfaces) guarantees a high level of efficiency in heat recovery. The flue gas is cooled down to 2–3°C above the temperature of the heat consumer. As there is no mechanical heat exchanger in the flue gas, the SaveEnergy condenser is not subject to soiling. By cooling to below the dew point, the water from the flue gas condenses. The pH level of the condensate is neutralised and cleaned from the solids by the water treatment system. Only the cleaned condensate surplus is discharged into the sewage system. This means that the SaveEnergy condenser does not require any fresh water. 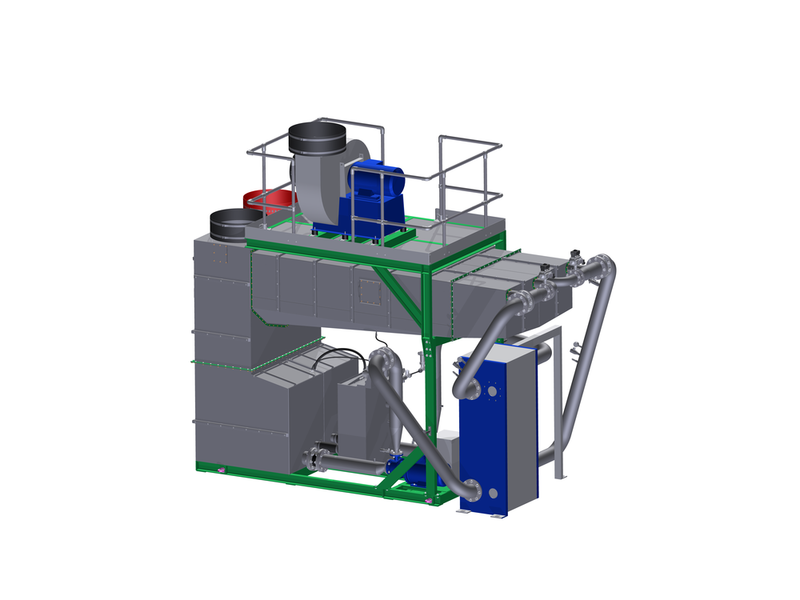 Thanks to the intensive injection of process water into the flue gas, the SaveEnergy flue gas condenser assumes the function of a flue gas scrubbing system. Here, coarse dust particles in the flue gas are bound to the surface of the liquid by the inertial forces. They are then transported into the water treatment system via the process water. The preliminary cleaning of the flue gas to remove coarse dust particles is crucial for the efficient functioning of the SaveEnergy wet electrostatic precipitator, which discharges the small dust particles from the flue gas downstream.